“EXPLORE, DISCOVER AND ENJOY THE QUEEN OF ALL ISLANDS”: BALI. GUARANTEED DEPARTURE IN SEAT-IN, EVERY FRIDAY AT BALI. LOW PACKAGE RATES. EXCELLENT SERVICE AT THE SPOT. PAY ON THE SPOT. NO PREPAYMENTS, NO CREDIT CARD GUARANTEES REQUIRED ! We Inspire. We Plan. We Execute. We Care. We bring you the best of Indonesia ! Explore, Discover and Enjoy Bali, with our 12 Day / 11 Night Bali round tour with many highlights included. Our “BALI: CULTURE, ACTION and BEACH” round tour is designed for those visitors to our legendary island, who are keen to explore and enjoy it all. 12 Days / 11 Nights start at only U$D, 796 per person !!!! Seat-in. Accompanied by a friendly local English Speaking tour guide. Overnights in charming small scale hotels, including daily breakfast. NO PRE-PAYMENTS ! NO CREDIT CARD GUARANTEES ! PAY ON THE SPOT ! Guaranteed departure every Friday at Bali. and other guide languages available (ask us for the supplements). Few other exotic destinations have as much to offer as Bali does to amaze, impress and bring joy to even the most spoiled and experienced traveler. Bali isn’t just a holiday destination exclusively for the somewhat older and high end travelers. Without doubt this island presents itself to any budget as a perfect destination for an unforgettable holiday. Thanks to fantastic flight fares with the best airlines from anywhere and in combination with our razor-sharp package prices this thrilling program will fit most budgets. Just take a look at the trip our innovative and always energetic Product Managers have composed. Arrival at Bali airport, and welcome by the local tour guide. Direct transfer to the hotel in Ubud. Check-In, and free time for leisure to rest after the long journey. Overnight. Relaxed breakfast in the hotel. Pickup by the tour guide, and explore the magical surroundings of Ubud. First visit is to the holy ‘Tirta Empul’ water temple of ‘Tampaksiring’, to lay some Hindu ceremony offerings and have a blessing for a prosperous vacation and trip around magical Bali..
Next we visit the old King tomb graves at ‘Gunung Kawi’. Lunch break in a local restaurant (not included), and we continue to visit some of the famed artisan villages surrounding Ubud, each known for its own specialties since generations, like the villages of Mas (paintings), Celuk (silver) and Batubulan (stone and woodcarving).. And we end the day with stroll through the Monkey Forest of Ubud. Free evening where you can make a stroll through this small and cozy town, and enjoy a meal in one of the many local or international restaurants. (*)Ubud is probably Bali’s best known small town (it actually consist of 14 villages) and is widely considered as the cultural, holy and arts centre of Bali. During day time it can be crowded by visitors, but during morning and evenings it still has the typical and magic charm as it has always been. Ubud is a popular holiday and residency place for jetsetters, artists and bohemians since decades, and absolutely recommended to spend some nights in or around Ubud. Try to catch in the evening a local performance of a Balinese dance. (*)Tirta Empul Temple: theTirta Empul Temple in Tampaksiring is one of the 9th holiest temples in Bali, and is built around a natural spring. The crystal clear and fresh, supplied by 12 sacred springs fountains water in the temple is considered as the most holy water in Bali, and the Balinese Hindu devotees come from all over the island for cleaning and purification ceremonies, and often bring the water in bottles to their house temple for further ceremonies. Also for foreigners there is the opportunity to have a short bath in the public holy pool inside the temple complex. Nearby is a big colonial villa which was used as the local palace by the first and founding President of Indonesia, and still in use to accommodate very important guests from the government. Escape the hustle and bustle and join us, to discover the ‘magic’ and, feel the ‘spirit’ of rural Bali, on our famous Eco/Educational Cycling Tour (Suitable for all ages, we also have Australian Standard Approved Baby Seats) The original and authentic eco/educational cycling tour, this tour was designed to take the visitor to Bali away from the tourist areas and show them the Bali they want to see – ‘the real Bali’ and to learn about the Balinese culture in the process. Tour programme: After being picked up at your hotel we drive in an air conditioned car to Penelokan, Kintamani where we will start our tour overlooking the active volcano, Mt. Batur and its crater lake, enjoying the most stunning views in Bali. Here there will be an opportunity to take some fantastic photos before riding our mountain bikes through the heartland of Bali, travelling downhill on non tourist, secret back roads and minor village roads (with little traffic), experiencing typical Balinese daily life and enjoying the beautiful Balinese countryside on route to Ubud. We ride through lush forested areas, plantations full of Balinese staples and cash crops (cloves, coffee, cocoa, vanilla, tapioca, taro, local vegetables and exotic tropical fruits), through timeless small villages and lush rice paddy panoramas. And we will ride to throngs of adorable Balinese children will be there calling out ‘hellos’ and wanting ‘high fives’ on the way down. If we chance upon a ceremony (and we often do) you will be invited to witness the events and our guides will offer explanations. We will show you a Bali other visitors never see and our experienced guides will explain this amazing culture and the relationship the Balinese have with their beautiful island. We have numerous stops on the way, including a visit to a Balinese home/compound, (where you get to see firsthand how the Balinese live outside the tourist areas), a Balinese plantation (where you learn of the medicinal and culturally important uses of local plants, the process of making coffee and see many of the spices you have used in cooking and tropical fruits growing in their natural environment. We also get to sample many exotic tropical fruits, local herbal teas and coffees, including Coffee Luwak, (the most unusually produced and most expensive coffee in the world). We will also stop off at a village temple, an enormous Banyan tree and see stunning rice paddy panoramas. We will go for a short walk in the rice paddies to see villagers planting and harvesting rice (you can join in) and see traditional craftsmen at work en route. Lunch, served in a restaurant, set in the serene surrounds of rice paddies, is a delectable Balinese feast, including the smoked duck/chicken the guide books rave about. We also cater for vegetarians and can accommodate children with special meals.Our car also follows us down the mountain in case anyone is not feeling well. After lunch you have an optional visit to the Ubud Monkey Forest and temple complex. This tour is a full day tour (though, we can cater for time requirements) and we like to describe it as not just an adventure, but a cultural, ecological, learning and culinary experience! We promise you won’t be disappointed! Afterwards we will return to the hotel , and you will have free time to wander around in Ubud . Our tour guides will give alerts about potential Balinese dance performances to enjoy during the evenings. (Note: hotel transfers and activity are based on SIC. English speaking only). “an absolute must do and not to miss” !!! An unforgettable whitewater rafting on the holy "Ayung River" through the jungle near Ubud! You will be picked up at your hotel and taken to the departure point of the rafting. There you will receive instructions on how you should behave on the boat and receive a life jacket, paddle and helmet. Then the adventure starts. For about two hours you drift on the whitewater river, passing local villages, incredibly beautiful nature and waterfalls. Maximum up to six people in one boat + guide are allowed. After the rafting you will have a sumptuous lunch included in the price and time to change into dry clothes.Bring with you: dry clothes, shoes or sandals that can get wet and a little cash money for a drink at lunch and tipping. Tip: there is a waterproof bag on board of the boat. We highly recommend that you do not take your camera on the rafting trip. Better to buy a waterproof disposable camera. After lunch transfer back to the hotel. Note: you might find offers for whitewater rafting which are cheaper than ours. There are multiple rafting companies in Bali, however not all of them offer the same quality and level of safety. We only cooperate with the best (foreign specialist management! ), with proven records, safety and proper insurance. Pay a bit more for your own safety! Price: U$D 60,-pp (no minimum). A visit to the world-renowned elephant park in the village of Taro north of Ubud. Includes a 30-minute ride on the back of an elephant through the local jungle. Runs daily and no minimum number of participants. Hotel transfers and lunch are included. Price: U$D 86,-pp (Min. 02 Pax). Notes: Hotel transfers and Activities are based on SIC. English Speaking guiding only. Excursion rates are subject to change. INSPIRATION…. Include a COOKING CLASS in Ubud ! There are many cooking classes available in Bali.. Some are good, some are so-so, some are bad.. This is Asia, where successful products and concepts are easily copied…many times with a poor quality, and meant for gaining quick and easy cash… Some (even the famous ones) are just a stage show for an ego-driven owner / chef doing a floor show rather than actually ‘teaching’ the participants..
Our Cooking Class partner is one where even well-known Chefs from Asia and International star Chefs have attended the classes, and they are always commenting on the professionalism of the class. The class begins early morning in the markets of Ubud, where the chef explains the use of all local vegetables, tropical fruits, and spices on array, selecting those for the subsequent cooking class. The members of the class do the actual chopping and cooking, under the chef’s supervision, then on the competition sit down together and eat the dishes produced. Participants go home with recipes (and even a certificate) and the knowledge how to prepare these delicious Indonesian dishes. Ideal for those staying a couple of days in Ubud. Contact us for more info. PRE-BOOK AND INCLUDE IN THE HOLIDAY ITINERARY: start at only U$D, 65,-pp. Another beautiful day ahead, full of action, surprise and amazement. Early morning call, and we start a 2 to 3 hour-long gentle trek, accompanied by an official Park Ranger through the jungle and woods. Enjoy the beautiful vegetation and unique animal life, such as schools bog black long tailed monkeys, leguana’s, leopards, deer, tropical colored birds and butterflies, wild pigs, etc. (The gentle trek is suitable for anyone with a normal walking ability. Presence of animals cannot be predicted). Note: the activities and hotel transfers are based on SIC. English speaking only. Afterwards a free afternoon to enjoy. In the afternoon you will be transferred to the local harbor of Menjangan. Here you will board a local boat and head towards an abandoned coral beach deep within the National Park. Like a true boy scout you will spend the night in a basic tent on this patch of paradise. An exclusive and unique experience that will last you a lifetime! The beach is situated next to a Ranger Post, which is strategically placed there as a sanctuary for the endangered Bali Sterling bird. Only few of these beautiful singing birds are left in the wild. The local cook will prepare you a simple but delicious BBQ meal on a bonfire, while you can relax, go for a swim or go snorkeling around the mangrove. At night – if there is a clear sky - thousands of stars flicker and glimmer on the black canvas, because there is no light pollution here. A private exotic night under the stars!The Ranger Post houses a simple toilet and shower facilities. There is no hot water, but after a full day in the sun you won’t regret that. The tent is nice and cozy with a clean inflatable mattress, a pillow and each other. That’s all you truly need, right? Includes: Lunch / Dinner / Breakfast, Snorkeling gear rental. Operates between April 01 – Nov 30th (dry season). *In case of bad weather or other unforeseen events the night will be spend in a comfortable hotel in Pemuteran. Relaxed breakfast in the resort. Afterwards a free morning to enjoy. Approx. 3 to 4hrs including the boat transfers; by boat to the spectacular and world famous reefs surrounding Menjangan Island. The reefs and marine life and underwater gardens are recognized as absolute world class for diving and snorkeling alike, and even the most experienced divers will be surprised at the great diversity of marine life that exists here. Along with a snorkel guide, you can also go snorkeling over this colorful and magical underwater world. Even for the inexperienced snorkeler, your guide will be happy to teach and assist with techniques. A simple lunch box, snorkeling guide and rental of snorkeling gear are included. In the afternoon back by boat and car to the resort. Later afternoon; a wonderful surprise awaits you once more during this tour! You are invited for a visit at a local village during evening time, where the local people will entertain you with a fantastic “night under the stars”, and where they will perform one of those legendary and world famous dance and music spectacle… “The real thing” and rarely seen by other tourists… Enjoy! Back to the resort for the overnight. Note: the activities and hotel transfers are based on SIC. English speaking only. Breakfast in the hotel, and departure from this location which will last with you for probably always… as we head to the beaches of Southern Bali. As you are experienced in the meantime with the concept of our Bali tour, we do not just drive from A to B, but make it another fantastic day, as we will drive through the real heart of Bali, visit the spectacular rice terraces of Pupuan, and the iconic sea temple of Tanah Lot, before driving south to the beach destination. Check-out and Pickup from your hotel in Pemuteran is at 5am. Drive to Lovina Beach in North Bali, and board a local ‘Jukung’ typical fishermen boat, and set out before the shore looking for the dolphins, who start jumping out of the sea when the sun arise after the mountains. A hugely enjoyable experience. There is never a 100% guarantee to see the dolphins as they are free animals. There is a 95% change, sometimes they are out with hundreds, sometimes a few… Afterwards a breakfast will be served in a restaurant, and continue the tour to South Bali. 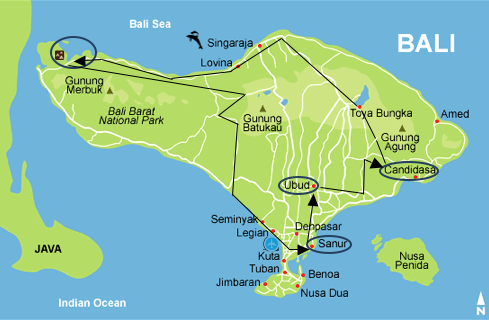 (*) Sanur: unlike the other famous beach resorts of southern Bali, such as Kuta, Legian and Seminyak, Sanur has managed to retain its typical Balinese character. There is a mile long white beach, protected by coral reefs, and along the beach you can walk on a 5km long pedestrian and bicycle promenade. There are a lot of nice shops and a very wide choice of restaurants. There are no shopping malls, and there is no night life ... but these are found in Kuta area, just half an hour away by a cheap taxi.. (*) Other beach destinations, like Kuta, Legian, Seminyak, Nusa Dua are possible. Contact us for the options. Breakfast in the hotel. Free time until pickup for the transfer to the airport, and departure. Check-out from the room is around noon. Or book with us an extension stay. Note: €uro rates are meant as an indication only. The exact rate will be converted to the exchange rate against the U$D on the day of booking. PROMO !!!! SAVE !!! !Every first Friday of the month: 20% discount on Package A (Superior) !!!! Only U$D 796,-pp ! (No discount on the High Season and other Supplements). Package Peak Season Supplement and Conditions: 23 Dec > 10 Jan: US$ 290 pp Note Peak Season: compulsory N/Y dinners will apply, depending of the hotel. No check-outs allowed around new year, depending of the hotel. 10% discount is given for the third person in triple occupancy room. Triple will be one DBL room with extra folding, rollaway, mattress on the floor, or take out bed. Not all hotels provide TPL occupancy. On request only. Age 02 - 10 yrs: sharing bed and room with 02 adults, get 50% discount from package rates. Age 02 - 10 yrs: with extra bed, sharing room with 02 adults, get 10% discount from the package rates. Supplement per person: U$D 55,-. Note: only available for private tours. Choice: French / German / Dutch / Spanish. HOW AND WHEN DO I PAY ? For some amendments, or hotels decided by your own choice, we may ask you a deposit payment, according to the hotel conditions and rules. Featured hotels are example hotels. Confirmed hotels will be informed two weeks before arrival at Bali. Room types are based on available ROH (Run of the House) rooms / generally the lowest room category. It is possible to be upgraded to higher room categories. Contact us for the supplements. You want to make your own choice of hotels ? Possible ! Contact us. Due of Nyepi (Balinese New Year) any arrival or departure in Bali is not allowed, nor by road, sea or air, after sunset the day before and before sunrise the day after. Unofficial date for Nyepi in 2017 is scheduled for 28 March. Date has to be reconfirmed. 1.1. All ground transportation by best available, and with domestic required safety and comfort standards, bus or coach. 1.2 Due of the routing, some transfers / tours might be operated by mini or micro vans. 1.3 All drivers are experienced with the cars, routing, safety rules, and are aware of the international etiquette.All drivers are neat in hygiene and clothing. 1.4 A luggage van will be provided when necessary. 1.5 All parking and toll fees. 2.1. Guiding and / or hospitality service on all days of the itinerary. 2.2. No guiding service during the free days in the itinerary, and during local flights. 2.3. Local English speaking tour guides / tour leaders. 2.4. English Speaking Hospitality services in Bali, and 24/7 emergency service. 2.5. Guides may vary on each destination. 2.6. All guides are experienced with the itinerary, and with handling international groups. All guides are duly licensed. 3.2. Included meals, other than breakfast, are excluding beverages, side and extra orders, and are served in local restaurants or hotels. 4.1. As featured in the proposal, or similar. 4.2. Featured hotels are example hotels. 4.3. Rooms booked are ROH (Run of the House) rooms. 4.4. Supplement applies for special room type / location requests. 5.1.As featured in the itinerary, including the entrance, donation, parking fees. 5.2.Important: if any increase in entrance fees or national park permits will be charged. 5.3. (PR) in the proposal means “Private Tour, Transfer, Excursion” read “Activity”, and generally no other participants will share. 6.1. No flights are included. 6.2. If the domestic flight(s) is included; we keep the right to change at any time the fare, according to the airlines changed fare, unless payment have been received by us. OUR PREFERRED DOMESTIC AIRLINE … GARUDA INDONESIA ! 7. MISCELANNEOUS Welcome / starters kit in Bali (per room), incl a handy souvenir bag, sarong pp, personalized welcome letter, big bottle of water, refreshing towels, mosquito repellant, hand sanitizer, booklet with practical tips. As featured in the itinerary, including the entrance, donation, parking fees. Important : If any sncrease in entrance fees or national park permits will be charged. (PR) in the proposal means “Private Tour, Transfer, Excursion” read “Activity”, and generally no other participants will share. (SIC) in the proposal means “Seat In Coach”, meaning that generally the Tour, Transfer, Excursion” read “Activity” will be shared with otherparticipants. The Activity is generally organized by a 3th party. We source and contract the best available 3th party organizers, based on their reputation, quality and safety record, and not based on the best pricing. However, we only act as a middlemen for the reservations and payments, and do disclaim any responsibility regarding the quality, delay’s, accidents, and whatsoever. All Terms and Conditions fall automatically as those one of the organizer, and are directly between the participant (client) and the organizer. If one not agree with our disclaimer prior to the formal booking, we strongly advise to book the activity directly with the activity supplier. The assigned private tour guide or tour leader, will generally not join the activity, and the tour guides assigned by the 3th party organizer are generally English speaking only. SIC activities included in this proposal are; Cycling Tour, Trekking Tour, Village Performance Tour. Optional activities are mostly based on SIC. A perfect day to end a fantastic holiday in Bali is enjoying a one day SAILING CRUISE to the tiny tropical “Lembongan Island”, east of Bali. Sail away from Bali to Mushroom Bay at Lembongan Island aboard the ‘Aristocat’ luxury Sailing Catamaran. Includes : hotel transfers, complimentary soft drinks and refreshments, a delicious BBQ lunch, snorkeling, village tour, submersible coral viewer, optional diving options. And when the day is done, the luxury catamaran makes a leisurely cruise back to Bali, arriving as the sun sets after another glorious day in Bali. PRE-BOOK AND INCLUDE IN THE HOLIDAY ITINERARY: only U$D, 99,-pp. Free admission to the Waterbom Park in Kuta, Bali. Chosen as the best water fun park in Asia, and the 5th best water fun park in the world. (Admission voucher should be requested on the spot by the guests. Is not automatically reminded / distributed.). 1.1.All personal expenses, like: meals, drinks, souvenirs, extra entrance fees etc. 1.2.All what is not mentioned in the itinerary and under stipulation: ‘included’, Tipping and gratuities for: guides, drivers, driver assistance, bell boys, room maids, waiters … Tipping is never included in the price proposal. Tipping in Indonesia is normal and expected. The average daily amount for tipping depends of the itinerary. For round tours this will be an average 10 to 15 U$D per day (for the driver, guide, sightseeing guides, bellboys, etc). For Beach Stays this will be an average of 2 to 5 U$D per day (housekeeping, etc). It is strongly advised to inform the guests about tipping. 2. Unforeseen Circumstances: Due to unforeseen circumstances and not known circumstances on Oct 01, 2016, all given rates may become invalid and recalculated, like fe. official rise in petrol costs, increase of sightseeing entrance fees, eo. However any confirmed rates upon booking request will remain valid from 6 weeks before departure, except for airline fares which remain subject to change at any given day, and until payment have been received by us.The agent will respect the given and agreed itinerary, but will not take any responsibility regarding unknown closure of sightseeing objects, not available roads or access, or force majeur situations. Upon acceptance of our offer you are accepting our terms and conditions. 4.Notes: International passports should have an expiry date of at least 6 months after the return date. Not all nationalities are allowed a Free Visa upon Arrival (valid 30 days). Contact us for more info. OTHER GENERAL CONDITIONS & TERMS MAY APPLY. Contact us for your inquiries ! If the itinerary goes into Java, please be aware that several included sightseeing objects might be closed on Mondays, local public holidays and without prior notice. If the itinerary goes into Sumatra or Flores, please be aware that the general hotel standards are lower than those in fe. Java or Bali. If your clients visit Bromo during the high seasons, be informed that it might be extremely crowded on the viewing points at the Penanjakan Mountain to see the sunrise, sometimes with thousands of visitors at the same time.. If your clients visit Bromo Sunrise from Malang, be informed that the departure time from Malang will be at 1am. Notes and disclaimer regarding overnights in Guesthouses and Homestays; some guesthouses and homestays deliver real 3* qualities, others are very basic, with fe no tv, no a/c (usually fan) (if aircon is available it might be a noisy one), sometimes only cold water, rooms might not always be clean to standards, or with spots on the carpet or wall, staff not always speak and understand proper English, bed sheets however washed might look not so nice, breakfast can be basic, mice like mousse, rats, cockroaches, geckos might be seen… We never can give guarantees regarding the quality, and is purely based on price & quality. Flexibility and a soft sense of adventure is required from the guests, otherwise it is advised to pay supplements for upgrades to higher standard hotels. Overnights are quoted on the ROH, and might be subject to additional charge if no ROH is available and an upgraded room is needed. If your clients have an excursion included to see the sunset at the Tanah Lot Temple in Bali; please be informed that the return transfer to the hotel in South Bali, after the sunset, might take up 2 to 3 hrs, due to extreme heavy traffic and traffic jams caused on the way back from Tanah Lot. It should be understood by the guests that in Indonesia, particularly in Sumatra and Java, that the combination of distances in kms and duration is very relative. A rather considered short distance in kms might take much more hours on the road than guests have imagined.Fe. for the routing Yogyakarta or Solo, to Bromo or Malang / from Bromo or Malang to Kalibaru or Ijen / from Kalibaru or Ijen to South Bali might take 12 hrs. Depending of the program or routing ahead, but generally at 7am, sometimes between 5 and 6am. In general the logistic is planned to have an arrival in the hotel before sunset, generally 6pm, however no guarantees are given as it might depend of local circumstances. Excursions inside the Bali National Park ,snorkeling trips around Menjangan Island and dolphin spotting trips in Lovina, are only guided by local guides and only English Speaking. The assigned tour guide will not join the excursions, unless pre-booked and with a supplement. If domestic flight bookings are included; we prior to make the bookings with Garuda Indonesia Airlines, and in some cases with Air Asia Indonesia. We might propose other Indonesian domestic airlines, due to routing or scheduling reasons. Note that all Indonesian Airline carriers, with exception of Garuda Airlines and Air Asia, are blacklisted by the EU. This means; none of this blacklisted airlines are allowed to fly within the EU airspace, and safety warnings and concerns have been distributed regarding those airlines. If we make bookings & issue tickets of those airlines we do this with the automatic permission of the travel agent or client upon request for the booking, but we do disclaim any further responsibility regarding safety, delays and results of delays. All our guides / tour leaders are Indonesian. All our foreign language (English, Dutch, French, German, …) speaking guides are officially certified to guide in the language. However, the foreign language is not their native mother tongue, and might not be 100% fluently or accent free. Flexibility and cooperation from the guests is required. We keep the right, with or without prior notice and without any refund or compensation, to replace a ‘certain language’ (fe. Dutch, French, German,) promised guide to replace with another ‘English’ speaking guide. This due the limited availability of foreign language speaking guides during some periods, and the promised ‘certain language’ guide might fall sick or might not operate due to other reasons, while no replacement is available. Due to potential delays or cancellations of fe. trains, flights, boats, normal and fast ferries, it is not advised to ad an excursion or activity after the ETA. If guests are booked through us on a ferry boat or fast boat transfer; if the boats are not going out or operate with delays without a reasonable prior information to us, due of various reasons like fe. ; created by nature, like; bad weather, stormy weather, high seas (act of God), or closed harbor, strikes, or whatever other reason; we will assist the guests with alternatives if there are alternatives. However if any additional costs arise those will be charged to the guests on the spot. Local ferry boats are what they are, and we have no choice to chose a certain operator. Fast boats; we chose operators with a good record and reputation. However; we only act as a middleman for bookings and payments, but we do disclaim any responsibility regarding delays, non operating, bad service, accidents, and whatsoever. Fast Boat transfers from / to Bali <> Gili Islands / Lombok; are not advised for children below 5yrs, pregnant women, people with back problems, people with pre-existing health problem, people elder than 64yrs, and those people are automatically disclaimed from any responsibility and insurance coverage by the fast boat operator. Hotel transfers at Bali are based on SIC transport. The boat transfers might include several stops enroute at other destinations before arriving at the booked destination. There is never a guarantee that the same guide or tour leader will accompany the guests during the entire stay. It might happen that different guides will handle the guests. During some visits at sightseeing objects the guests might be guided by local temple or palace guides based on SIC (joining-in with other travelers or groups). Even for confirmed travel itineraries, we keep the right to change slightly the itinerary on the spot and during the travel program, caused by unknown reasons at the time of the confirmation, like fe. special ceremonies, holy days, road blockings, local events, etc. However, the included attractions and sightseeing will be respected. Tipping is never included in the price proposal. Tipping in Indonesia is normal and expected. The average daily amount for tipping depends of the itinerary.For round tours this will be an average 10 to 15 euros per day (for the driver, guide, sightseeing guides, bellboys, etc). For Beach Stays this will be an average of 2 to 5 euros per day (housekeeping, etc). It is strongly advised to inform the guests about tipping. Traveling in Indonesia requires a flexible and adventurous altitude towards all kinds of unexpected situations and circumstances. It might happen that a proposed and booked hotel turns out to be below the expectations from the guests. If clients require on the spot to move to another hotel, this is possible based on the following conditions; most hotels will ask a cancellation fee, whether from one to four nights depending of the hotel’s policy. The cancellation fee will be charged directly to the clients. If the alternative hotel turns out to be more expensive than the original booked one, the difference in room rate per night will be charged directly to the clients. If the alternative hotel turns out to be less expensive than the original booked one, there will be no reimbursement. For each change of hotel on the spot, a handling fee of US$ 20,- will be charged either directly to the clients, or upon agreement directly to their travel agent. Room types in the proposal are as what they are featured on the contract agreements we hold with the accommodation providers. A “Villa” does not automatically mean what most Westerners understand what a “Villa” is, but might be f.e. only a room in a bungalow style, with only a bedroom, a bathroom and mostly with a terrace. We advise to learn more about the room type at the respective accommodation website if available. It should be understood that if a ‘sunrise’ or ‘sunset’ is included in the proposal, we can never guarantee the quality, and might mostly be of a good quality during the dry seasons. It should be understood that we cannot guarantee the exact sights, or none sights at all, of animals in National Parks, open nature or open sea (>fe. the dolphins in Lovina). It should be understood that overnights in a tent or on a boat are very basic. Usually a mattress is provided, and (sometimes) limited fresh water is available for shower and sanitary. Overall the sanitary facilities, if available, are simple and basic. Certain proposed and / or included itinerary items are sensitive to various unpredicted reasons, like fe; village performances e.o. In case a certain itinerary item cannot be respected, a best and closest alternative will be proposed, but not exceeding the costs of the original item. It should be understood that most activities, especially in Bali, are organized and operated by 3th parties, are based on SIC, meaning that other people from other organizations will share the activity, and this includes the hotel transfers , which might cause several pickups / drops enroute, and includes fe. cycling tours, rafting tours, elephant park tours, fast boat transfers by boat and car, and others. The assigned tour guide to your guests will usually not join this activities, as the activity organization provides their own guides / English speaking only. For most activities there is no insurance coverage provided by the activity organizer for children below 4yrs, for people above 64yrs, for pregnant women and for people with pre-existing health problems. Feel free to ask us prior the booking the name of the activity organizer. For trains / boats / flights / normal ferries and fast ferries; we only act as middle men for bookings, issue tickets and pay tickets. We source and chose for the best and safest options, but we do not guarantee this is the best and safest option. In not any way will we take any responsibility regarding the quality of the voyage, delays, cancellations, lost of properties, accidents, missed connections or missed activities caused by delays or cancellations. In case of accidents we disclaim any responsibility and involvement, and any follow up is between the guest and the transport company. If one not agree with this stipulation; we are willing to provide information about the options and ticket counters, in order that the guest can buy the tickets directly, or if the option is there book directly online with the particular transport supplier. It should be understood that the archipelago of Indonesia is sensitive for natural and unpredictable disasters, like fe; earthquakes, volcano eruptions or closures, landslides, high seas with closures of harbors, etc. In case of an unpredictable event INDONESIA HOLIDAYS DMC will do all what is reasonable possible to assist guests on the spot, with potential alternative routings or itineraries, but it should be understood and automatically accepted that in case of an unpredictable event any extra costs and expenses which might arise to have a suitable solution, should be paid on the spot by the participants of the program, unless there is a written guarantee that the extra costs will be bearded by the original booking agent. Accidents, sickness, evacuation, or other unfortunate happenings to the guests might occur and happen at any time. It should be understood and automatically accepted that in case a case is handled by the insurance company of the guest, that Indonesia Holidays DMC will not get involved at any moment and for any reason, as this might turn against the policy of the insurance company. We do not take any costs involved to us. Although in case of a local hospitalization we will bring a courtesy and comfort visit when and if this is possible. Indonesia maintain extremely though and active rules and laws when it comes to narcotics including the considered soft drugs, with an absolute zero tolerance, and with heavy penalties, even dead penalties. For recreational users of certain narcotics, it is strongly advised to check before departure of their country all trouser pockets, luggage suitcases, backpacks, etc, if there is no forgotten ‘item’ left somewhere. Users of prescribed drugs or medications are advised to bring with them a doctor recommendation in English and the original copy of the purchase ticket. Be informed that March 28, 2017 is ‘Nyepi day’ (Balinese Newyear) in Bali. No movements are allowed from 27 March at noon till 29 March at noon, and guests are not allowed to leave the hotel premises, and not all facilities in the hotel might be operative. Be informed that on June 25 and 26, 2017 it are ‘Idul Fitri’ (end of Ramadhan) celebrations in Indonesia. During the period of mid-June till mid-July there will be extreme traffic on roadways, flights, ferries, trains, etc., which may cause big delays and unpleasant and discomfort situations for clients traveling especially in Java and Sumatra. Due to limited guides available during the festive period, early bookings are recommended. If your clients are traveling out from Europe, it is strongly advised to bring Euro cash, and not U$D cash. Euro notes to maximum € 100 per note, not dirty, folded, stamped, torn.. ATM are widely available in Indonesia, except at some remote locations or islands. Some nationalities need to verify with their banks if their ATM cards are allowed internationally. A valid passport with an expiry date of minimum 6 months ‘after’ the return date is necessary. Ask & See our General Terms & Conditions.